May 24, 2013: Contract negotiations started on a high note. UPS was making record profits. When the company demanded healthcare concessions, it was standing room only at Teamster rallies. Members were ready to fight for their healthcare. But our International Union wasn’t. Angry members who feel blindsided on healthcare are organizing a Vote No movement in many areas. They are passing out leaflets, talking in break rooms, wearing Vote No T-shirts, and have a “Vote No on UPS Contract” Facebook page. They are gunning to shoot down the national contract and some supplements too. If history is any guide, the contract will certainly go down in locals where members are organized and taking coordinated action. That’s what happened last time. The national contract passed with 65 percent of the vote. But it was rejected in numerous locals where TDUers and other reformers got active—including in New York Local 804 where members rejected their supplement by a three-to-one vote. 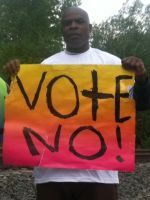 By voting no, Local 804 members saved 25-and-out pensions. They kept organizing and took back their union in the next local election. And they just negotiated the best supplement in the country. Rank-and-file organizing can pay off—but there are few quick fixes. If we want to win lasting changes, we’ve got to be organized. TDU is the only independent movement that brings Teamsters together in our locals and across the country to rebuild union power. Take the first step toward winning better contracts and standing up to UPS. Join TDU. Meet other active Teamsters and learn proven strategies for getting members involved and rebuilding union power.